Rev. Dennis MARTIN in his history of the Bedford Christian Church states, "The Bedford Christian Church had its official beginning sometime in 1845." 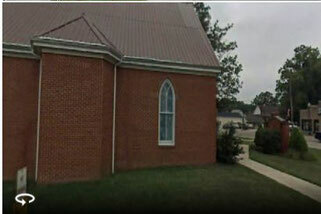 The church was worshipping in a schoolhouse which stood beside the property where the church now stands. In later years, this schoolhouse was torn down. The Dr. Wilbur HANCOCK home stood there until recently purchased by the Bedford Christian Church for a parking lot. 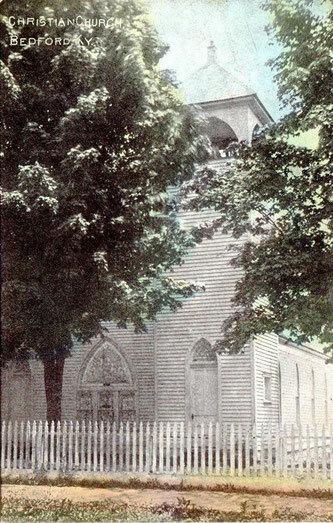 In December 1845, Eleanor YOUNG deeded the property to the Bedford Christian Church. In this deed to the trustees of Bedford Christian Church, Deed Book C, pages 225-226, Eleanor YOUNG stated that the ground was to be the property of the Christian Church as long as it was used for religious purposes. This parcel of land was known on the Bedford town plat as Lot #67. Soon after this transaction, the building of a brick church was begun and completed in early 1846. Mrs. Betty BELL, grandmother of Dr. W.P. BELL, a dentist and elder of the church, contributed most of the labor. The slaves of Mrs. Betty BELL constructed the church with her overseer in charge. At this time, Bedford was a small settlement yet the church flourished. Then as the older members died and others moved away the church roll decreased and services were discontinued. The Civil War, of course, contributed to its decline. In the late 1860s, Mr. PRICE started a college. Mr. Fallis MAHONEY was an active member of the Bedford Christian Church after it reopened. Mr. Fallis MAHONEY attended the college along with the HARDIN sisters: Carrie, Mary, Martha, and Lula. The college operated for a time. Church services did not resume until 1874. In that year, Madison MAYFIELD made an earnest effort to revive the Bedford Christian Church. Madison MAYFIELD was the grandson of Dr. Zibe TROUT who was a local physician and church member there. Mr. MAYFIELD visited homes all over the county and a new membership began from those who had no previous church relationship or whose churches were at a distance. Robert T. MATTHEWS was a young man from Transylvania. He served as pastor and church membership increased. After two successful revivals held in the late 1890s. The first revival was held by Trimble County native, Will MADDOX. The second revival was led by Henry County native, J.B. YAGER. By 1907, church growth demanded a modern structure and the board of directors agreed. A committee composed of E.W. TANDY, C.W. HOOD, W.B. GILLES, J.W. MCMAHAN, and A.J. GIDDENS was appointed to move the old church and erect a new building on the old foundation, adding foundations for the tower and alcove. The contract for the construction was given to W.B. JACKSON of Trimble County. The building completed in 1909 cost the membership $1,650, respectively. Mrs. Lydia ADAMS, wife of F.A. ADAMS, contributed generously toward its construction as did other members. Today, the ADAMS Memorial Windows and the GILLES Memorial Windows are still admired and appreciated. The church was fortunate to escape the fire of July 30, 1930, in which the Baptist Church and Trimble Banner office were totally destroyed. Sparks did fall on the shingle roof but were extinguished by the Carrollton Fire Department as they entered Bedford to help fight the raging flames. The only damage was to the church roof, which was soon replaced by a metal one. The church will be forever grateful to Carrollton for saving the church. Bedford had no fire department at that time. The contract was given to Iva McCLURE of Madison, Indiana who was also a native of Trimble County. Four rooms and a hall, with basement, were added at a cost of $1,500. Soon after, a furnace was installed to heat the building, replacing the old stoves. On February 22, 1942 the church was saddened by the death of Elder William B. SNYDER, a native of Milton. He was well educated, a graduate of Hanover College and Bible scholar. He was loved and respected by all who knew him. William B. SNYDER entered the ministry in 1906 as the pastor of Mt. Byrd Christian Church. He pastored churches in Missouri for many years then returned in 1919 to reside in Milton. SNYDER held the pastorate in many churches: Mt. Byrd, Bedford, Milton, and Wise's Landing. Beech Grove and Union Grove were also served by Rev. SNYDER as long as he was physically able. The body lay in state at the Bedford Christian Church for several hours before the funeral service was held at Mt. Byrd Christian Church on Febuary 24, 1942. During the April 1942 church revival, a memorial service was held for Rev. SNYDER, their former pastor and friend. The church received a beautiful spray of flowers from the SNYDER family on Easter Sunday in keeping with their celebration of Christ's Resurrection from the dead. On October 28, 1945, a dedication service was held for the new bulletin board. It was presented by Mr. and Mrs. Johnny PERKINSON and Mr. and Mrs. Wallace WRIGHT. Later this bulletin board was replaced by one made of brick. In 1950, the Wedding Ring Class gifted an automatic timer for the bulletin board. In December 1945, the church celebrated the one hundredth anniversary of its organization with a Centennial Program consisting of services by Rev. Glenn L. MURDOCK, current pastor. The various church organizations, pastors, and others closely associated with the work of the Bedford Christian Church were remembered. There was an additional dedication of the new electric powered church organ. An attractive eight page booklet contained a historical sketch of the church since its organization on December 1, 1845 compiled by Mrs. Gail RANSDELL and Mrs. Drew NEWMAN. Some of the material in this history was taken from that bulletin. Rev. Paul RICHARDSON came to Bedford as pastor in 1947 when housing was scarce in town. The church had no parsonage. Mrs. Maggie B. MORGAN, a long-time member of the church, offered and gave the ground upon which a parsonage was built. See Deed Book 3, pages 55-56, for the particulars of this transaction. If a parsonage could NOT be built on this parcel of ground the lot reconveyed to Mrs. Maggie B. MORGAN. This housing issue gently coincided with problems at the Macedonia Christian Church. Declining membership due to deaths and members moving out of the area amplified when vandalism made it nearly impossible to keep the church locked and in good repair. These reasons prompted the gift of the Macedonia Christian Church building to the Bedford Christian Church to build a parsonage. The actual cost of the parsonage was $11,625.01 with volunteer labor and discounts keeping the total cost down. John HARMON donated the bulldozer time in addition to discounts given by local merchants for materials. Ike HARDIN did some hauling with additional thanks to the Farmers Supply and Farmers Equipment Company. Under the leadership of Paul RICHARDSON (Minister, 1947-1952), a number of programs were initiated. Among the first was a Transportation Committee responsible for getting those in need of transportation to church, organized by Glenford HOOD, Chairman of the Membership Development Committee. Harold BRYAN was chosen chairman of this Transportation Committee. By 1951, the church decided it needed additional space. The original plan was to build Sunday School rooms and restrooms. However, it would be some time before plans materialized due to lack of funding and support. In March 1952, building specifications were given to Joe FROST, the architect. The plans were later submitted to the congregation for approval. Work commenced and the Sunday School rooms were completed June 21, 1953. A dedication service was held. Tom GILTNER, minister of the Douglas Boulevard Christian Church in Louisville, gave the dedicatory message. Parking became a concern in 1957 prompting the purchase of the front portion of the T. L. GOSSMAN property which lie across and to the north of the church. A one-story brick building on the property served as the Catholic parsonage at one time. The church ladies redecorated the building and used it for Sunday School rooms, church socials, and other activities. The brick structure was demolished in 1959 when a new brick structure replaced it. It was leased to the Post Office department who took occupancy on November 11, 1959. The committee members named to supervise the construction of the new brick structure were as follows. The upper floor of the post office building was unfinished. Charles Edward PERSELL headed a group in 1960 who finished the large room across the front. This was used for youth activities and other church functions. Other rooms were gradually added. One room serves as the pastoral study and church office. Participation in the worship service improved with the installation of a public address system by W. C. SLOCUM. The sanctuary was remodeled in 1963, which refreshed the paint on the walls and ceiling. The pews were refinished. New draperies adorned the pulpit and the newly raised platform for the choir. Carroll BRUMLEY, Lyle WOOD, and W. C. (Wilbur) SLOCUM served as craftsmen on the latter project. Rev. W. C. McALLUM, who delivered the message. Rev. Earl TURNER, who spoke of Love's Labor. All plans made were carried out by 1970 and remodeling began. 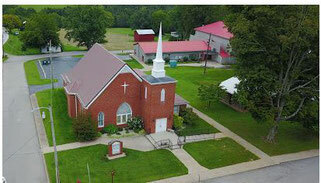 The building received a new brick exterior veneer, new roofing, remodeled tower, and the vestibule received a new spire. The sanctuary was carpeted and redecorated. Air conditioning was installed. A bulletin board, a gift of Silas and LaVaughn McKINNEY was erected. The $24,000 renovation was financed through the Bedford Loan and Deposit Bank. A number of active organizations, past and present, grew out of this church. The Ladies Aid Society assisted the needy and provided spiritual programs. The society organized in 1890 under the leadership of Mrs. Carrie L. HOOD along with Mrs. Amy HANCOCK as Treasurer throughout the life of the society became the Women's Council in 1945. This organization was replaced years later with the C.W.F. yearbook reports in the Yearbook of the Christian Church. The names and dates of recent ministers were contributed by Mrs. Bernice LITER from the church bulletins. Through the long history of the Bedford Christian Church, it endeavored to support institutions and organizations dedicated to spreading the Word of God. One institution being the College of the Bible, the oldest seminary of Christian churches. The name formally changed to the Lexington Theological Seminary on August 1, 1965. The same date it celebrated one hundred years of service to the Christian churches of Kentucky and the nation. It has always striven to cooperate with other churches in Bedford for the betterment of the community in leading men and women to the way of salvation. Due to lack of space, many of the fruitful revival and labors of the devoted ministers have not been mentioned. The Bedford Christian Church is long indebted to Dennis MARTIN for the history of the church. on behalf of the Trimble County Historical Society.